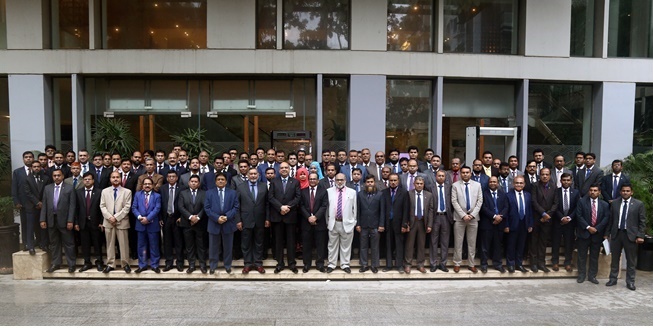 Quarterly Business Conference of Dhaka & Rajshahi Zone of First Security Islami Bank Limited held on October 11, 2018 at Amari Dhaka Hotel. The Conference was presided over by Mr. Syed Waseque Md. Ali, Managing Director, First Security Islami Bank Limited. Among others, Mr. Abdul Aziz, Additional Managing Director, Mr. Md. Mustafa Khair, Deputy Managing Director, Divisional Heads, Branch Managers of Dhaka & Rajshahi Zones attended the Conference. The conference reviewed the operational performance of individual branches for the period of July-September 2018 and set various targets for next periods of the year 2018.